This course will cover the topics normally covered in a high school pre-calculus course. This course is normally taken by students in grade eleven or twelve. Students should have completed Algebra 2 before enrolling in Pre-Calculus. A detailed course outline is shown below. Precalculus by Michael Sullivan, 4th edition, published by Prentice Hall, 1996, ISBN: 0132285940. This is an excellent text, known for its clarity. It has received many excellent reviews. The topics covered in this course will correspond closely to the topics covered in this book. Students will be assigned reading and practice problems from the textbook. Students will be given specific assignments to complete each week. Assignments will consist of Practice Problems from the workbook and textbook, instructional videos online, and written assignments. In this class there is a distinction between Practice Problems and Homework Problems. Practice Problems are found in the workbook and textbook, and students check their answers with the solutions provided. Homework assignments and tests are printed from the website, completed, and turned in for a grade. Not all students require the same pace and difficulty level. Some may need or prefer a class that is more challenging and at a faster pace, while some may desire a class that is not accelerated. This class is offered simultaneously on two difficulty levels, regular and honors. The lectures are the same for both. The honors students will have additional homework problems that are more difficult, and on each test will have an extra page with more challenging questions. Note that the honors class is not an AP class. It is simply a more challenging version of the same course. 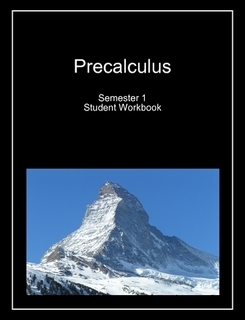 The goal is for the classes to closely correspond to �Regular Precalculus" and �Honors Precalculus" classes at a good private school. Students may decide whether they will take the standard or honors version of the course after completing one or two chapters. These topics comprise the material normally taught in a high school precalculus course.